To many, William Shakespeare’s plays exemplify perfection in theatrical writing. Others find them incomprehensible, though if those in the latter group could shed their preconceptions, they might in fact recognize aspects of Shakespeare’s oeuvre reflected in their own experience. Take “Hamlet” for instance, surely one of the most famous in the Shakespeare cannon. It might not be a common experience for a young man to have his uncle murder his father as a means of succession to the throne and later marry his mother the queen. Nor might it be precisely in that young man’s experience to then speak with his dead father’s ghost, and take orders from said ghost to exact revenge on those who had wronged him. After experiencing the loss of his father, regardless of the manner of death, a young man might imagine what it would be like to speak with his father again, even in modern times. It is also not without possibility that this same young man could love someone deeply (as Hamlet does Ophelia), and for a variety of reasons be they tradition, position, or other circumstance, lose the object of his affection. Kit Wilder, Associate Artistic Director of the City Lights Theater Company, claims that “Hamlet” is “one of the best plays ever written.” Wilder goes on in his program notes to say that “the play is a mirror” and more directly lays out many parallels between the characters’ struggles and personal experiences with which many members of the audience surely have dealt. Wilder has chosen to move his current production of “Hamlet” to the present, no doubt making it easier for costume designer Jane Lambert, but also making the actors more familiar. He creatively edited the script removing almost a quarter of the text to effectively trim it to run under three hours, even including two 10-minute intermissions. He also modified a few archaic terms for clarity and in select cases, reordered some of the dialogue and soliloquies to tighten the action. Further, given the intimate venue, he reduced the cast size by combining various minor characters or by reusing actors in multiple minor roles. A prime example of his reordering is moving Hamlet’s Act III, Scene I “To be, or not to be” soliloquy to the end of the scene keeping the action moving ahead of it. Though that changes the motivation slightly, it works well, and gives Hamlet even more reason to be despondent. The resulting production is taut, flows smoothly, and keeps all of the intrigue and suspense intact. Thomas Gorrebeeck is marvelous in the title role. His first entrance, still in mourning over the death of his father and dressed in a black suit and sunglasses, flashes on “Men in Black”, at least until he pulls out his flask, and we realize the boy is drunk. He’s light on his feet and fleet of tongue, injecting solid emotion into the 400 year old text. Gorrebeeck and Walter M. Mayes (as the ghost of King Hamlet) are convincing as father and son, both comfortable with the language, and very natural as Mayes’ ghost directs Hamlet in his task of revenge. Mayes also ably assumes other roles such as that of Player 1, who leads the troupe acting out the production of “The Murder of Gonzago”, the play Hamlet stages to execute his scheme to expose Claudius’ murderous act. Sarah Moser as Ophelia is at first a bit too mousey, seeming slightly unsure of herself. She comes into her own later in Act III, Scene I with Gorrebeeck in the dangerously physical scene that the two of them execute with surgical precision and startling explosiveness. Later when Ophelia’s madness ensues, Moser is exquisite, capturing the “otherworldliness” that Ophelia appears to be experiencing. Jeff Kramer’s Polonius is also quite good. His cultured demeanor is smooth and his speech eloquent, certainly befitting a man of Polonius’ status within the hierarchy. Tom Gough (Claudius) and Kristin Brownstone (Gertrude) make an interesting pair. Gough is rough, emphasizing that the King is less than reputable, and yet he’s tender with Brownstone as his new bride. In an interesting directorial choice, Rosencrantz (Adam Magill) and Guildenstern (Martin Gutfeldt) are “hipsters”, sporting jeans, jackets, backpacks, and beer. Guildenstern even rolls a joint during their first meeting with Hamlet. The two are a little stiff, but given their characters are enlisted by the King to spy on their friend Hamlet, their aspects are understandable. They both have that look of guilty deniability when Hamlet confronts them down pat. Aaron Walker effectively plays Hamlet’s only loyal friend, Horatio, his character’s compassion and fear for Hamlet’s safety ringing true. 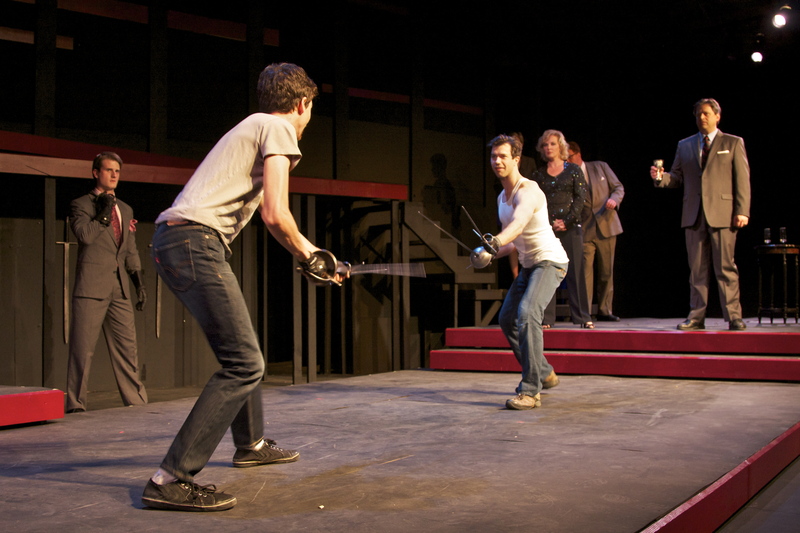 Wilder, a self-proclaimed “sword geek”, has done a nice job in choreographing the final swordfight between Hamlet and Laertes. Both Jeremy Helgeson (Laertes) and Gorrebeeck execute the moves with panache. Rounding out the cast are Beverly Griffith and John Tourtellotte both ably playing a variety of bit parts including the remaining players in “The Murder of Gonzago”. Griffith’s grave digger (taking the place of two “clowns” in the unedited version) at the top of Act V kept the audience in rapt attention, reacting to her every word on opening night. This is a production well worth seeing. And for those fearful of Shakespeare, this might just be the remedy for that affliction. Where: City Lights Theater Company located at: 529 South Second Street, San Jose, CA 95112. When: Thursdays – Sundays through 15 April. See www.cltc.org or call 408-295-4200 for more information. Great Stuff, do you have a bebo profile? Thanks, but no, A Good Reed Review is not on bebo.